Coastal Voices is about storytelling. It’s about slowing down, shutting up, and listening to the people who call Louisiana home. Their experiences of living on land and with water are unique to Louisiana, but they are also transferable to other coastal cultures in the United States and around the world. Their stories serve as acts of cultural preservation, responses to ongoing transformation, and reflections on future orientation. Michael Pasquier, a native of Louisiana, joined LSU’s faculty in 2008. He has spent his entire life, in one way or another, listening to people sharing their experiences of coastal living. 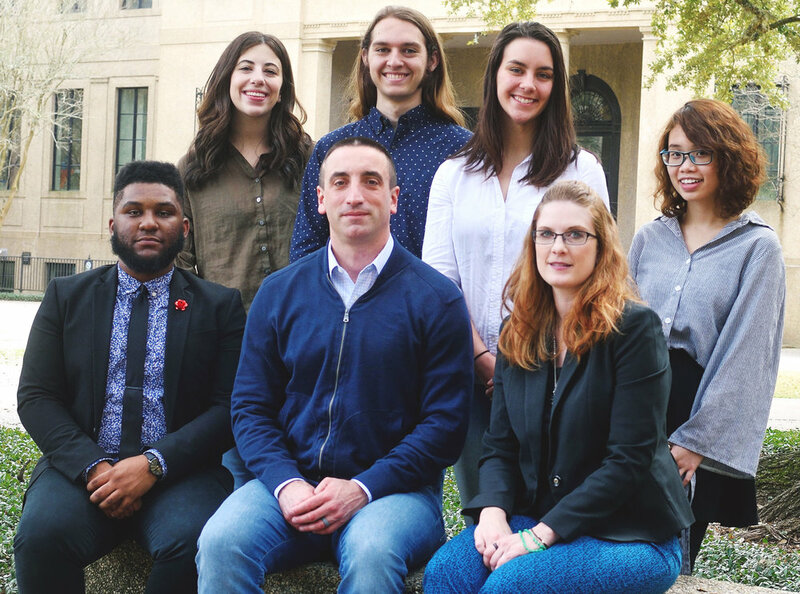 With funding from the Whiting Foundation, Michael and a team of LSU students started the Coastal Voices initiative as a way to broaden and deepen the public understanding of natural and human challenges facing Louisiana’s endangered coast. The Coastal Voices team invites you to listen to the stories on this website and to share your own stories of living on land and with water in Louisiana. Courtney Barr is an Associate Professor of Graphic Design at Louisiana State University. She is Faculty Advisor to the LSU Graphic Design Student Office, a student design studio that has produced award-winning work recognized nationally and internationally. Her work has received recognition from AIGA | the professional association for design and the American Advertising Federation, and has been published in the Print Regional Design Annual, Graphic Design USA magazine, the Big Book of Green Design, and Ladies of Letterpress: Dedicated to the proposition that a woman’s place is in the printshop. Michael Pasquier is the Jaak Seynaeve Professor of Christian Studies and Associate Professor of Religious Studies and History at LSU. He graduated from LSU in 2002 and received his PhD from FSU in 2007. His work on the history and culture of the Mississippi River Delta and Coastal Louisiana has been supported by the American Academy of Arts and Sciences, the National Endowment for the Humanities, and the National Endowment for the Arts. He is the author of Religion in America: The Basics, editor of Gods of the Mississippi, and co-producer of the film Water Like Stone. He is currently a Public Humanities Fellow of the Whiting Foundation for his work on Coastal Voices. Josh Jackson, a native of Louisiana, is a first-year graduate student in the LSU Manship School of Mass Communication. He graduated from LSU in 2016 with a degree in Theatre, concentrating in Film and Television. Josh puts his media experience to work as a news producer for WBRZ Channel 2 in Baton Rouge. He is also an accomplished director and lighting director, with several films appearing at festivals around the United States. Josh is the podcast editor and marketing director for Coastal Voices. Nhu "Nicole" Dao is a first-year graduate student in the Louisiana State University School of Art and Design. She graduated from San Diego State University in 2014 with a BA degree in Applied Arts and Sciences, Emphasis in Multimedia. She is currently a designer at Graphic Design Student Office (GDSO). Nhu designed the Coastal Voices website. Madelyn Smith, a native of Lafayette, Louisiana, is a junior studying Natural Resource Ecology and Management at LSU. She is the author of the book Louisiana Gone, which explores the history and culture of coastal Louisiana through storytelling and photography. Her photographs have appeared in LSU Research and LSU Alumni Magazine. In March of 2018, Madelyn delivered a talk at TEDxLSU about using storytelling to address coastal land loss in Louisiana. She is a member of the LSU Ogden Honors College and a 2017 Udall Foundation Scholar. Madelyn is the research assistant and video producer and editor for Coastal Voices. Taylor Goss, a freshman, grew up in Lacassine, Louisiana, and is now a dual major in Music and Entrepreneurship at LSU. He is a Stamps Scholar and a member of the Louisiana Service and Leadership (LASAL) program in the LSU Ogden Honors College. Taylor produced all of the music and soundscapes for Coastal Voices. Delaney McGuinness is a 5th year undergraduate student in the LSU Robert Reich School of Landscape Architecture (RRSLA) and President of the LSU Student Chapter of the American Society of Landscape Architects. As a part of the RRSLA curriculum, she recently 6 months spent in Rotterdam, Netherlands, where she worked at West 8, a landscape architecture and urban design firm, to learn about the Dutch approach to coastal issues. As a native of New Orleans, her education in coastal issues began on August 29th, 2005, when she was 10 years old. Delaney made all of the maps for Coastal Voices. Coastal Voices is a collaborative initiative that never would have happened without funding and support from the following organizations.